Why Does a Tiger Tail Sea Cucumber Split and is it Normal? A month or two after we purchased our Tiger Tail Sea Cucumber, it appeared that the sea cucumber split in two, each half taking up residence at opposite ends of the tank. This was a surprise to us as we were told when we purchased him that this was a possibility, but not likely to happen. I have found forums of other aquarists who have had a Tiger Tail for years and have never had it split, and some aquarists who’s Tiger Tail have split multiple times. The reason for this seems to be more reproductive rather than defensive. I was concerned that the Tiger Tail had split due to some stress, but now that it has been several months and we still have both halves, and have had no issues with them, then the split must have been for another reason. I never see them fully out in the open to know how big or small they are, only seeing their mouths protruding from their hiding spaces sifting sand. Both eat often and I find piles of sand castings regularly. I’m hoping they do not split again as I’m not sure our 75 gallon tank could accommodate more, and trying to remove a Tiger Tail would not be an easy feat. The concern at that point would be to have one die due to lack of food and the toxins it releases kill the tanks other inhabitants. At this point, there is not much we can do. It has been about 8 months since they have split, and have had no issues with them. If I by chance ever see one out in the open to nab, I will remove him, but so far they have proven to be very recluse. What foods do you use in your reef aquarium? What are these brown “bugs” in my aquarium? What are these white “bugs” in my aquarium? What is a Salinity Refractometer? 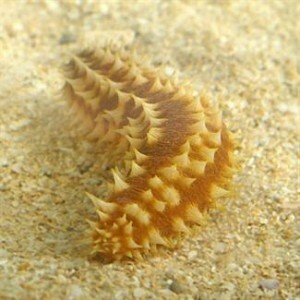 This entry was posted in Informational and tagged aquarium, Divide, reef, Reproduce, sea cucumber, Split, Tiger Tail. Bookmark the permalink.